The Imperium of Man is vast beyond imagining, stretching across most of the known galaxy, but it is a patchy, sparse Empire with many holes within which the enemies of man may lurk. Rogue Traders thrive in these gaps, carrying the voice of the God-Emperor into the dark places not yet reached by His light. This game takes place on the outer edge of the Imperium, in the area of space known as the Halo Stars on the periphery of the Segmentum Obscurus. 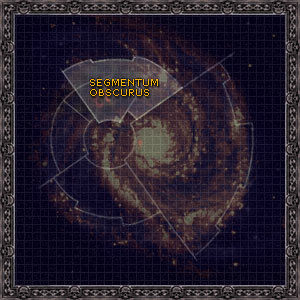 Like many other Segmenta (divisions of the Galaxy), the Segmentum Obscurus is (mostly) held by the Imperium. It is located to the north of Holy Terra, and its Segmentum Fortress is located at Cypra Mundi. One of its most notable features is the Eye of Terror. The Calixis Sector is an Imperial sector in Segmentum Obscurus near the Halo Stars and the Eye of Terror. Conquered by Lord Militant Angevin a thousand years ago, the Calixis Sector contains many heavily-populated and important worlds, though it lies a great distance from the Imperial heartland. Its first governor, Drusus, was one of Angevin’s most capable generals and is now revered as an Imperial Saint. The Koronus Expanse is the name given by Imperial authorities to a dangerous and only partly-explored cluster of the Halo Stars beyond the Calixis Sector, lying in what has become known in some quarters as 'lucky space'. The Expanse is accessed through the Koronus Passage, a treacherous but usually-navigable route from the way station of Port Wander to the Halo Stars, running between the Void Dancers Roil and the Screaming Vortex - the two great warp storms that seem to stand as daemon sentinels at the gates to Hell. As is true of the Calixis Sector itself, the Expanse was untouched by the God-Emperor's Crusade many millennia ago and so it is a realm of fearsome xenos, treasures beyond imagining, heathen worlds of men, and the echoes of ancient doom.